The Double Court House is a generous, modern family home designed for a larger block. The program stretches around two large courtyards, creating a series of interconnected indoor and outdoor spaces and providing a garden outlook to all rooms. The low slung building form is clad in black stained timber, a striking yet understated form that will sit sympathetically amongst the landscape. In contrast to the brooding exterior, the interior of the house is light, bright with contemporary charm. 3.5m ceilings extend through the main living zone accentuating the sense of space. 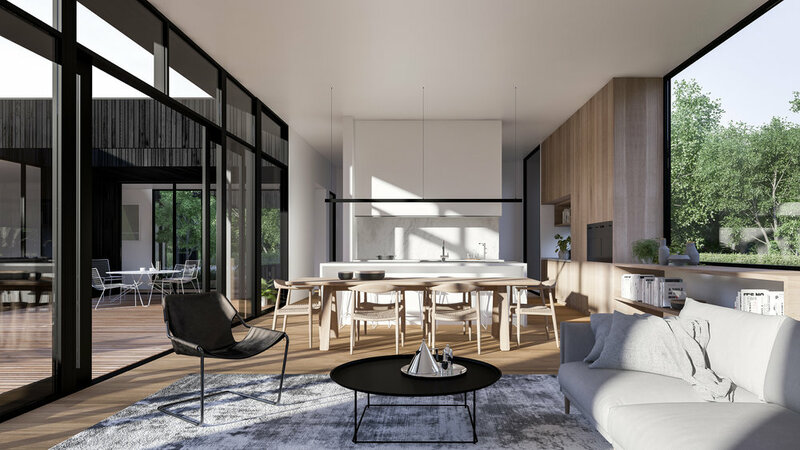 Large banks of glazing draw in natural light and breezes and create a high level of connectivity throughout the house. The Double Court House, Courtyard House and Scandi House make up the single level dwellings within the Auhaus Release. For more information, see our Supplier page. Please check your inbox to confirm your details. The floor plans will be sent to you via email to download.